We spend a good portion of our lives dreaming of “the one.” We have planned out their look, career, friend group, etc. all before we’ve met them. Has fantasizing over our perfect match hurt us? Are we missing our opportunity to find real love? Jack Kornfield, author of NO TIME LIKE THE PRESENT, shares why we find our best love when we let go of expectations. Romantic love can deepen when we let it. At first it is a kind of idol worship. It can come with idealism, possessiveness, jealousy, and need. Our songs and movies and dreams are full of idealistic, romantic love, the eros of sexual desire. “I want you, I need you, oh baby, oh baby.” You see another person who matches enough of your inner image of “the desired one,” your heartstrings resonate, and you are intoxicated, not only by his or her looks and wit and charm and strengths, but by how the person fits your own template of the one you want to love. The other person becomes, like Beatrice was for Dante, the ideal that awakens your own loving heart. You transfer onto the other person your longings, so he or she represents and carries beauty, strength, courage, intelligence, and steadiness. These qualities are also in you, but you don’t always know it. They are unconscious, so your beloved becomes the carrier of your own golden qualities, and being with her or him helps you feel lovable, complete, whole. You know the rest of the story. Placing your beloved on a pedestal works for a time, but slowly you look down from the golden glow and encounter the clay feet. They burp, belch, pout, get irritated, withdraw or cling, are too messy or too controlling. They become human. Of course, then you might discard the fallen lover and look for a better one, but this would be never-ending. Instead, when your idealistic love has been disappointed, a freer love is available. If you and the other person are a good-enough match, you can stay with the relationship and let it deepen and lead you to fuller, truer love. This is an invitation to love beyond expectations, clinging, or attachment. Still, attachment, clinging, and expectations will arise along with love, and there will be times when your love is mixed with need and fear. Here is what you learn. Whenever you cling to how your partner (or your children or anyone) should be, you create suffering. Your partner does not want to be controlled; he or she wants to be loved, seen, accepted, held in your heart, and honored and respected and blessed by your love. “To have loved one soul is like adding its life to your own,” said Meher Baba. True love, given freely, blesses the one you love and frees you at the same time. This is love that is openhearted, spontaneously offered, caring no matter what. Your commitment is to love, and your dedication is to honor the heart’s connection. Find love spontaneously. Don’t make your man a fixer-upper. Excerpted from No Time Like the Present by Jack Kornfield. Copyright © 2017 by Jack Kornfield, PhD. Used by permission of the publisher. All rights reserved. In this landmark work, internationally beloved teacher of meditation and “one of the great spiritual teachers of our time” (Alice Walker, author of The Color Purple) Jack Kornfield reveals that you can be instantly happy with the keys to inner freedom. Each chapter presents a path to a different kind of freedom and guides you into an active process that engages your mind and heart, awakens your spirit, and brings real joy, over and over again. His keys to life will help us find hope, clarity, relief from past disappointments and guilt, and the courage to go forward. 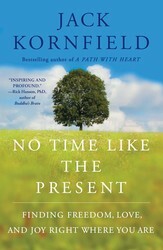 Jack Kornfield, PhD, is one of the best known, most respected meditation teachers in the world. A psychologist and founder of two of the largest Buddhist centers and communities in America, he is one of the key teachers to introduce mindfulness to the West. His books, which include A Path with Heart; After the Ecstasy, the Laundry; and The Wise Heart, are classics, selling well over a million copies, and translated into twenty-one languages.